Just when we thought we had seen it all, along comes 'Fusion'. This is a hybrid between Lilium longiflorium (the familiar white Easter Lily) native to the Liukiu Islands off the southern coast of Japan and Lilium pardalinum, native to Northern California. The parent lilies are so far apart both on the compatibility scale and place of origin, that you would never see the successful development of such a hybrid in nature. Plants are cross pollinated either in a greenhouse or in the garden, then under sterile conditions in a plant laboratory, the developing tiny embryo from each seed in the pod is carefully extracted from the seed husk and grown in a nutrient-rich agar solution, a process called "embryo rescue". When a bulblet has developed sufficiently on its own, it is planted first in a greenhouse for evaluation, and later moved into an open field for further study. At maturity, bulbs flower and multiply naturally. Flower color and form is typical of Lilium pardalinum, while leaves mimic an Easter Lily, being longer and more graceful. Whereas L. pardalinum carries is flowers more in a pendant presentation, 'Fusion' is a bit more outfacing. Late June / Early July Flowering. Light Fragrance. 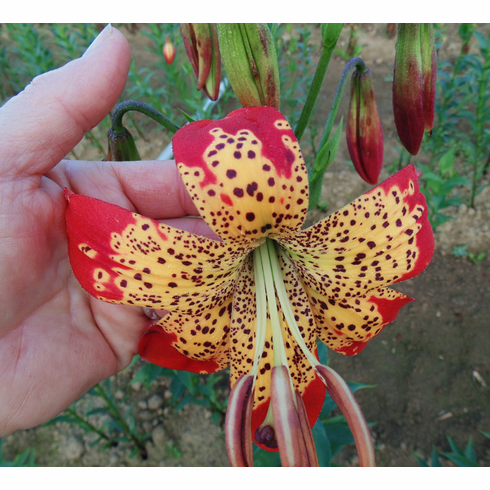 Bulb Size - Our standard for bulbs of this Easter x Asiatic Hybrid Lily Bulb cultivar ranges from Premium-size (16/18 cm) to Exhibition-size (over 20 cm). Click here for details.